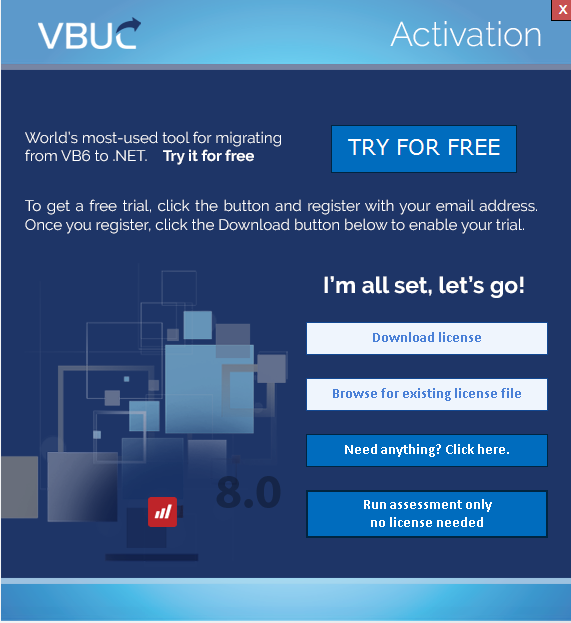 I downloaded the evaluation copy of UBUC to try out the tool to convert my Vb6 application into VB .NET (target language is Visual Basic). Flowed the conversion steps and receive the "VBUC license is invalid" when execute the step 4 Upgrade. Attached is the log file and the assessment report. Sorry for the inconvenience. We were able to identify the issue but we just need to validate it with you. Is it possible to attach the license (.lic) you were provided by email to the forum? Absolutely, here is the license that your company provided. We were able to properly identify the issue, thanks for the feedback. I am sending via email the steps on how are we going to proceed. I updated the license with your provided license. i still received the same error "UBUC license is invalid". Is there thing that i have to do beside replacing the license? I am able to view the license through the your program. It indicates the license is for 30,000 lines of code and 10,000 LOC limit per solution. The expiration date 04/24/2018 - 05/24/2018. Would you like me to resend the license that i used. Can you please uninstall the VBUC tool and re-install it again, but use the new license as reference. I reinstalled the software in the original PC with the latest license that you provided, received the error. Then, I installed the software in the different Windows 10 PC, and I received the same issue. Does your software support Windows 10? Below is the error from the error log. [04/26/2018 16:36:57:152] Avoided to create an empty .sln file because the upgraded project was not found. Is there a specific step that i need to follow for installing license? Let's work this together. To answer your previous question the VBUC can be installed on a Windows 10 computer, it shouldn't be an issue. I want to understand the whole process you are doing so I need a few things from your side. Setting up the VBUC license can be done through the "browse for existing license file". Select the new license you were given. After selecting the license, go to tools>license info. It should appear in here. The next thing I want to check is if you are able to apply the VBUC to a sample code. When you downloaded the VBUC it came in a .zip file. Inside of it, you will find a SampleCode.Zip. Select as the solution on the VBUC the folder (path: Sample_code>SKS>SKS_VB6) and apply the migration process. Please let me know if you still get the issue with this particular project. If you don't get any error the issue might be related to your particular project or the settings selected on upgrade options. If you still get the issue we can set up a meeting, for us to check what is causing the problem. I am able to make it work on Windows 7. The license is work. Is there any known issue for Windows 10? Good to hear that. We will definitely look deeper into the issue to identify what was causing it. We're trying to figure out what's the problem that you are experiencing on your environment, however our tests work with no issues. We will require of your support identifying the environment characteristics that might be affecting the tool, so we will need more information about your win10 environment in order to try to reproduce the problem you have reported. Can you provide us the information about your configuration? Note: I do not see the threshold information. That's really a good project to make. i will also thinking to work on it. But I am presently working as a professional content writer.